Bonnie & Clyde’s happy new home! We thought we would give you an update of how Bonnie and Clyde are going in their new home. They have settled in very well and we feel like we have always had them as part of our lives. They love the kennel and the big back yard to play in. They particularly like it when we walk them to the local park and down the fire trails – they have a great time. They are both very smart and obedient – we have taught them to sit at the kerb and wait prior to crossing the road – which they have picked up instantly. They are also very good at sitting for us – particularly if we have smackos in our hand. They like their new dog beds too – meaning they can sleep on the verandah and be closer to us. 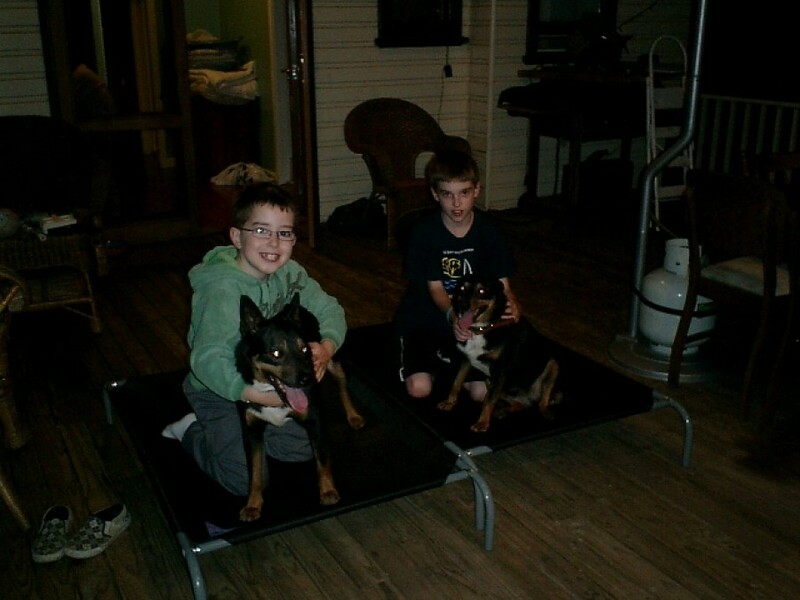 The boys (Josh 9, Ben 8) have been great with the dogs – becoming very responsible. They get up early and feed them and check their water supply each morning before going to school. They love playing with them too. They are beautiful dogs and we are very grateful to have them. Thanks for letting us adopt these beautiful dogs.